A new selection of our members' work. A new display of work from local artists who are members of the Eagle gallery. First show of the new year highlights the talents of our artists. A gift of platinum shows you are rich, but a gift of artwork from the Eagle Gallery shows that you love them! Paintings by Sue Melville, Ceramics by Anya Penger-Onyett and Textiles by Janet Cook. Treat yourself to a new piece of artwork from one of our Eagle Gallery Artists. Jane's first solo show at the Eagle. One not to be missed. New display of affordable art from our members. What is mixed media? Is the source important? How are ideas recorded? Which technique is best? How does an image evolve? What is Eco Pop? Should art ask questions? Can pictures be political? Why is an image chosen? Do everyday things matter? Some of the gallery members display work under the category "Abstraction"
Some of the gallery members display work under the category "Representation"
Another new display of artwork from the Eagle Gallery Artists. A chance to buy larger work! A highlight of the Eagle Gallery’s ‘How We Do It’ exhibition is a three-day event, over the Bank Holiday, of artists’ demonstrations. This drop-in event features demonstrations on the portrait, printmaking, collage, painting with wool fibres, watercolour, ceramics, stitching and experimenting with acrylic, culminating on Monday afternoon with an illustrated talk by architect and artist Anthony Mackay on designing a city. The exhibition itself runs from May 21 to June 14 centres around explanatory statements from our artists and contains our normal range of art, ceramics, glass and jewellery as well as cards and unframed work in browsers. For those who like to get out and about there are also 8 open studios to visit, providing the opportunity to talk to artists in their working environment and see a wider range of their work. In addition there are some small group exhibitions at Cottage Farm Nurseries, Cardington. Further details are available in the gallery and at www.eaglegalleryartists.co.uk. Cecilia takes over the gallery with a display of her beautiful artwork. ‘Escapes’ is an exhibition of paintings and photography by Eagle Gallery artists Patricia Ellis, Keith Wells and Sue Wookey. Using a range of media to capture their experiences but also joined by a deep love of watercolour, the artists present an escape into real and imagined journeys and encounters. Another collaborative display from our talented artists. Two of our longest serving members take over the gallery for one week only. Members' Themed Show : "Environmental"
The members display work based around a theme. First general show for 2018. All the Eagle Artists put on a show to remember - this time with added tinsel. We are pleased to announce the return of the Charity Christmas decoration sale. Our Christmas tree in the window will once again be adorned with festive decorations hand made by our artists. This year proceeds go to a Bedford based womens' refuge. Audrey Imber, Jo Spyropoulous and Isabel Grundy one week show. There will be a normal display of members' work alongside this special display. A one week show from the artists:- Val Bestwick,Jill Goodyear, Jill Taylor and Anya Penger-Onyett. A brand new display of the gallery artist's work. Les Miller "Dialogues: Land & Sea"
Les Miller takes control of the Eagle Gallery for one week only. Be sure not to miss it. ​Open Mon - Sat 10.00 - 5.30, Sunday 11.00 - 4.00. In the second themed exhibition of the year, the Eagle gallery artists tackle the subject of the seaside. Whose your favourite Eagle Artist? Come along and take your pick. 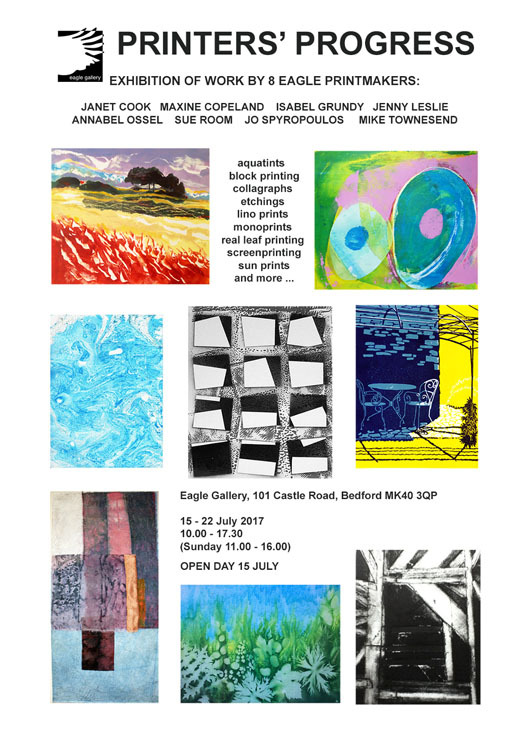 Janet Cook, Maxine Copeland, Isabel Grundy, Jenny Leslie, Annabel Ossel, Sue room, Jo Spyropoulos and Mike Townsend show off their printmaking skills in the first exhibition of its kind for the gallery. Another new display of member's work. 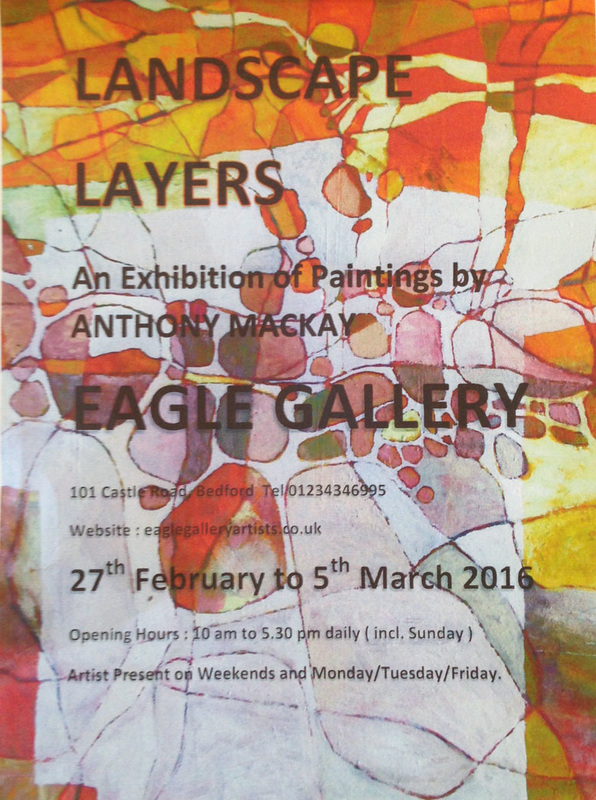 Anthony Mackay take over the gallery for a display of his work.The show includes recent paintings and drawings. Gallery open every day including Sunday from 10am - 5.30 pm. All the members pitch in to create an exciting new display of their work. Gillian Flack gets exclusive use of the gallery in this one week show. 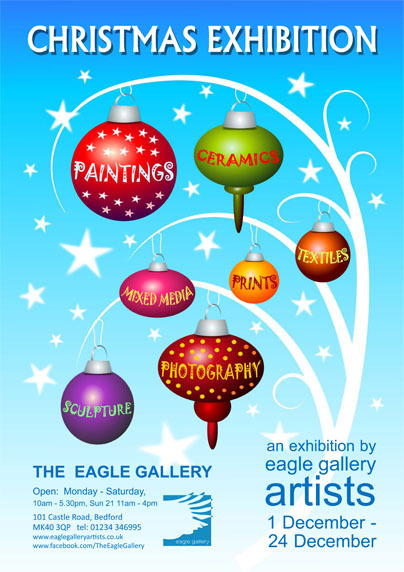 Another general show, where all 45 of the Eagle Artists have the option to show off their talents in a new exhibition. An exhibition of paintings drawings and prints by Mike Townesend. All the members pitch in to create an exciting display of their work. The Eagle Gallery artists take on a theme. Works exhibited will be under the theme "Through a Window"
Our first exhibition of 2017. In the final member's show of the year, be certain to get those last minute Christmas Presents. The Christmas Tree decorations this year are sold on behalf of Bedford Food Bank, and as before are exclusive creations by the Eagle Artists. 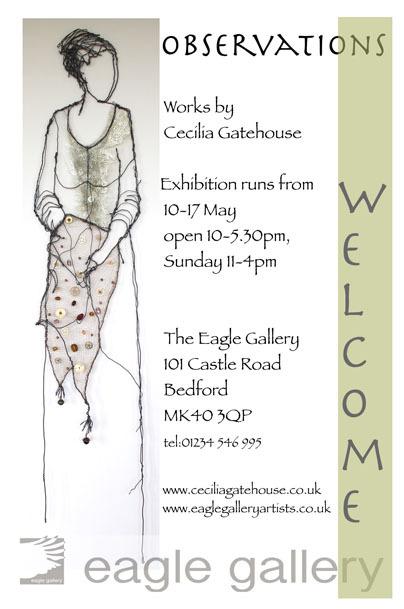 If you are not familiar with Cecilia's work, come along and be enchanted by her pieces. One visit should make you a fan. 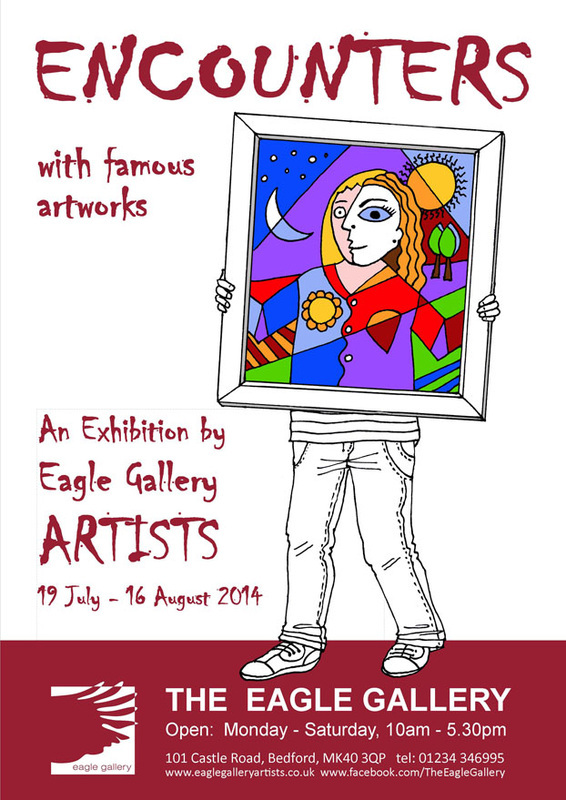 Quality affordable art from our Eagle Artists is on show for the next four weeks. New exhibition of members' work. These eagle artists share the gallery space for one week only. Another new selection of work by members of the Eagle Gallery. 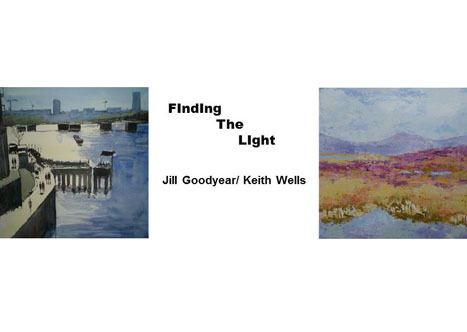 The Eagle Gallery presents its second themed show of the year, where the members present work based under the heading "Shadows and Reflections". Once more the gallery is refreshed with a new display of the members' work. Pick up a bargain from the new display of members' work. A one week show of recent work by Audrey Imber and Jill Taylor. Opening Saturday 14th May with drinks, nibbles and live music from 2pm. The artists will be in the gallery. A chance to catch up on the latest offerings from our membership. 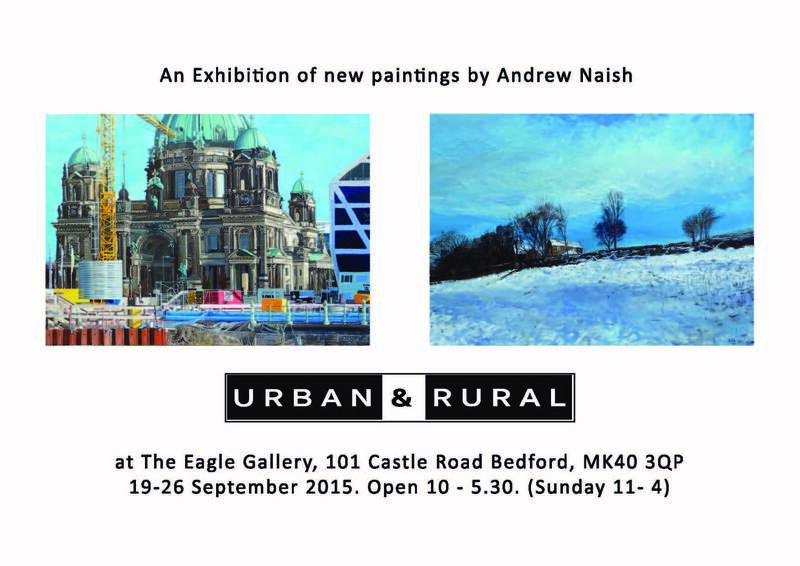 The first themed show of the year, where the artists explore the topic of "Bedfordshire". A new exhibition of our artists' work. 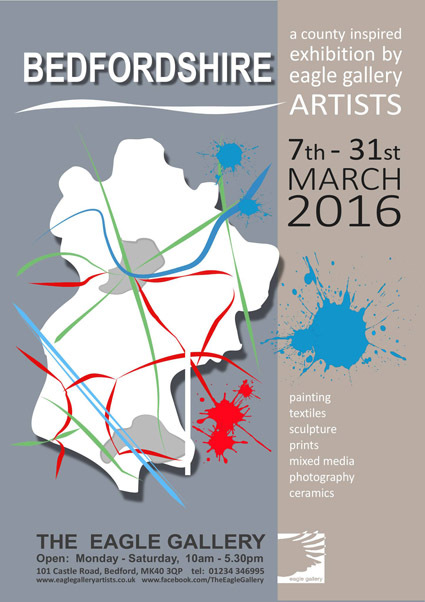 First Exhibition of 2016. See work from our members in this new display. It's that time of year again. Enjoy our parade of art leading up to the festive period. 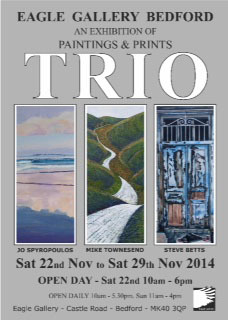 Just one week to enjoy the delights of these three artists. Expect some wonderful colours and textures. Our second and final themed show of the year. Our artists have created works around the topic of "contrast". Our resident photographer will surprise you with his work. Great opportunity to treat yourself to some wonderful imagery. New work from the members of the Eagle Gallery. Stop in at our Castle Road gallery for inspiration and a break from the hustle and bustle of everyday life. Work is for sale too if you need said inspiration at hand on a daily basis. New exhibition from the members of the gallery. More affordable art by local artists goes on display as our members submit work for this new exhibition. by Sue Melville and Annabel Ossel. Sue Melville aims to evoke the essence of particular landscape or garden using colour, line and texture in an expressive way. Sue paints mainly in acrylics but also uses watercolours. By contrast, Annabel Ossel’s acrylic paintings juxtapose blocks of bright colour. The seemingly random shapes, which are often geometric but rarely symmetrical, are inspired by both man-made and natural forms, such as kites, towers, fields and river deltas. A new exhibition of members' work. Here for only four weeks so hurry along down. The gallery is taken several of the Eagle Artists exhibiting some of their larger works. 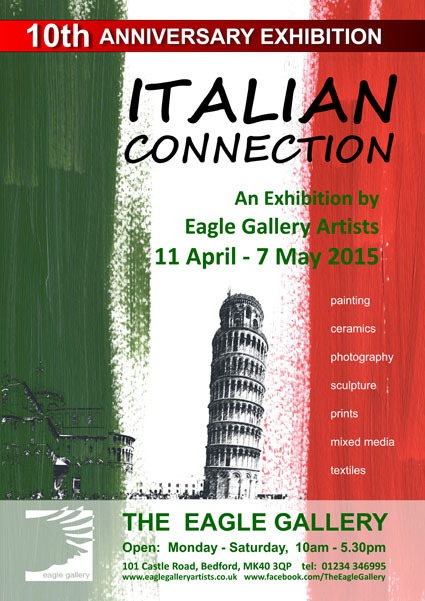 In the first themed show of the year, our artists are invited to submit work on the theme "Italian Connection". 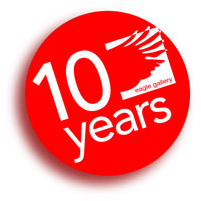 The Eagle Gallery once again opens for a new four week show of members' work. Time for another gallery re-hang. 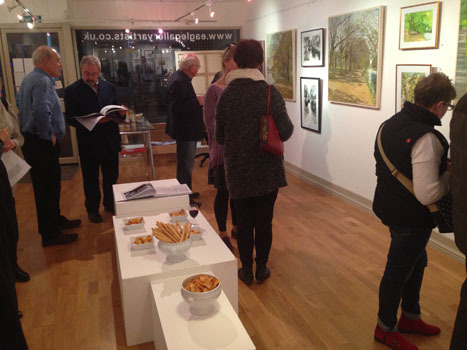 Many new works exhibited for the first time in Bedford. Hurry along! Great affordable art by local artists. In the first members show of the year, our members exhibit a variety of painting, sculptures, ceramics and more. Need that last minute Christmas Gift? Why not give that someone special a painting that they can treasure. If your not sure of their taste then get them a gift voucher available at the gallery. We are also selling specially made Christmas tree ornaments made by our artists, all proceeds to charity. This was very popular last year so come early as these items sell quickly. Jo Spyropoulos, Mike Townesend and Steve Betts one Week Show. 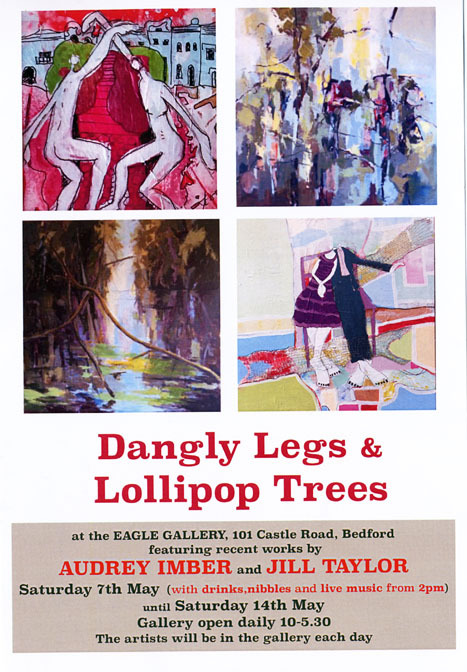 This is an exhibition by three figurative artists, exploring the natural and man made world in a variety of media. The artists will be in the gallery throughout the week. All our artists have to work to a brief. See what they come up with at this special exhibition. 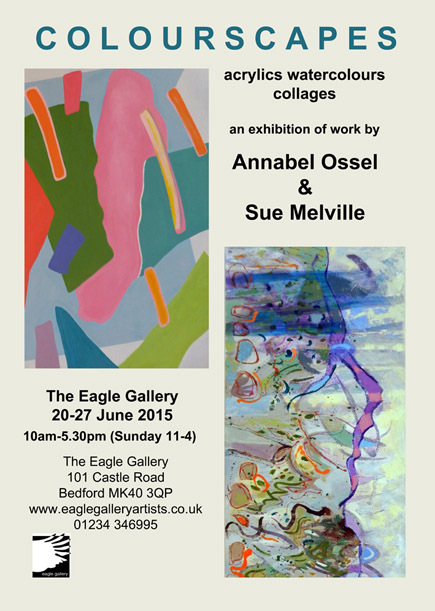 Explore the works of these two Eagle Artists as they take over the gallery for one week only. A new display of the latest creations from our collective of 45 artists. Get swept away by the work of Les Miller. Les takes over the gallery with his magical textures and colours. One show not to miss. Les is not having a private view this year but will be in the gallery all day Saturdays and Sunday and every weekday until 1.45. A new four week show of our artists' work. The first themed show of the year. Our members show works based on the theme "Encounters"
A New exhibition of member's work. by Patricia Ellis and Sue Wookey. A one week show by Cecilia Gatehouse. A New exhibition of member's work. Please note that the gallery will be closed Friday 18th April (Good Friday) Monday 21st April (Easter Monday) and Monday 5th May (Bank Holiday). 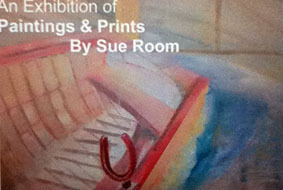 A one week show by Sue Room. Paintings and prints based on Venice and the East coast of England.